Coonoor, an important centre of the plantation industry, lies 6,500 ft. above sea level, 12 miles from Ootacamund, or Ooty as it is commonly known, which was the political and administrative centre of government. During the hot summer months there was an exodus from Madras and the heat of the plains to the hill stations, in particular Coonoor and Ooty. 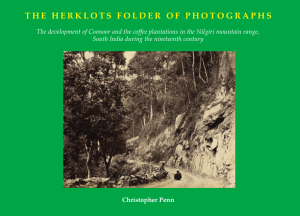 The book is illustrated with 77 photographs dating from 1860s and 70s, which were found in a folder on which the name ‘Herklots’ had been written. The prints show not only the development of the plantations surrounding Coonoor but also the growth of industry and commerce: the Herklots’ and Stanes’ plantations, the Stanes’ schools and the Groves’ engineering works and bakery; growth which was driven by both the profit motive and the families’ philanthropic and Free Church culture. 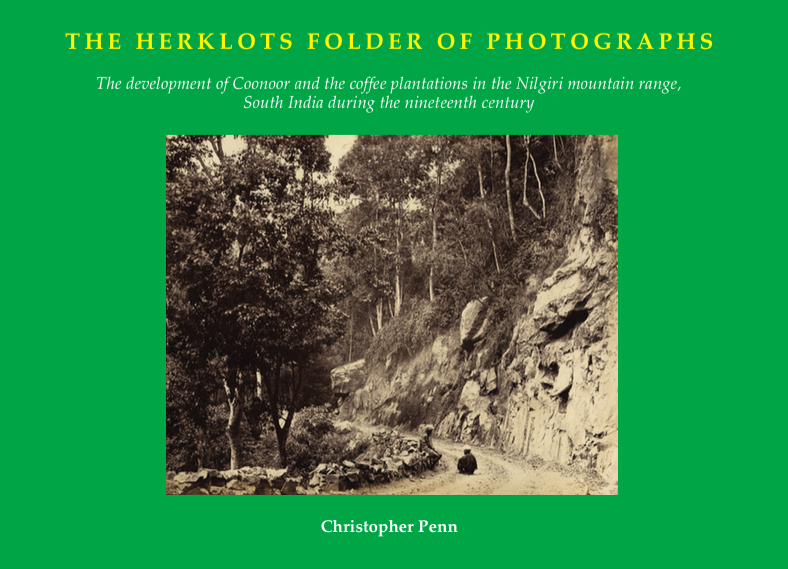 The photographs in the folder are unsigned in the negative but are thought to have been taken by pioneering photographers who lived or worked in Coonoor and Ooty: Dr Alexander Hunter, E. D. Lyon, John Nicholas, James Pettit Nicholas and A. T. W. Penn. Price £15.00 plus p&p £3.00 UK, £5:00 elsewhere in Europe, £10:00 rest of the world.